The originals of these items were primarily associated with the colonization of the North American continent. The powder horns are of water buffalo horn, with wood, brass, and leather detailing as appropriate. All axe heads are handmade to exacting specifications appropriate for their type. The axe handles are all of hardwood. 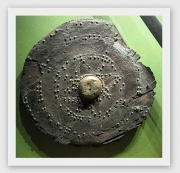 Prior to Europeans coming to North America, steel was unknown. 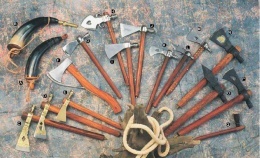 The axes and weapons used by the settlers were a wonder to the original residents, and highly desirable for their durability and versatility. Maecenas dapibus consectetur tincidunt. In tristique libero dui, quis pellentesque purus malesuada in. Nullam malesuada sodales nisi. Aliquam magna quam, ornare sed nibh nec, bibendum pretium massa. Morbi et felis lectus. Mauris at pulvinar nunc. Mauris pellentesque dignissim ipsum nec imperdiet. This page was last modified on 14 December 2014, at 13:14.